An archaeological dig is currently underway in Great Ayton. For those of you who are not familiar with the story, the cottage of James Cook, the father of the famous explorer, Captain James Cook, was sold in 1934, dismantled stone by stone and shipped to Australia where it was re-erected in the Fitzroy Gardens in Melbourne and is a major tourist attraction. In its place in Great Ayton, a memorial garden with a monument was created. Now in recent years, the garden had become neglected and work began late last year on a renovation. During the work, some foundation stones were uncovered at about a foot depth. The work was abruptly stopped pending an archaeological excavation. Apparently many years before the cottage was sold to be shipped down under, half of it had already been demolished to enable Easby Lane to be widened. 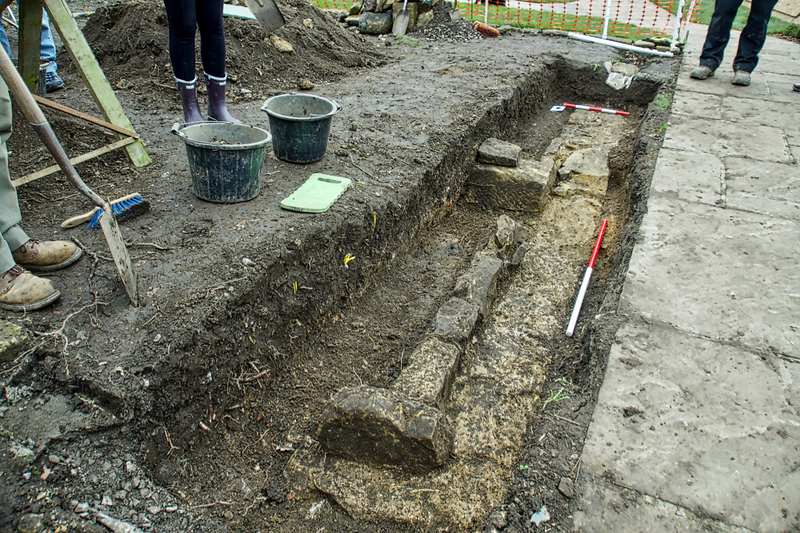 The newly discovered foundations would have been for the gable end wall of the part that had been demolished. There are super old photographs of the cottage before and after this demolition here (but caution it is a big pdf file and takes a while to download, be patient). James Cook senior built his cottage in 1755, a decade after his son had left home to become an apprentice in Staithes. It is supposed that the younger Cook would have at least visited his family in Ayton but there is no evidence that he actually stayed in the cottage. The dig is due to finish tomorrow.